But bask in it anyway? Well that’s exactly how I felt upon entering Brew & Brownie, an adorable cake and coffee house found in the center of York. 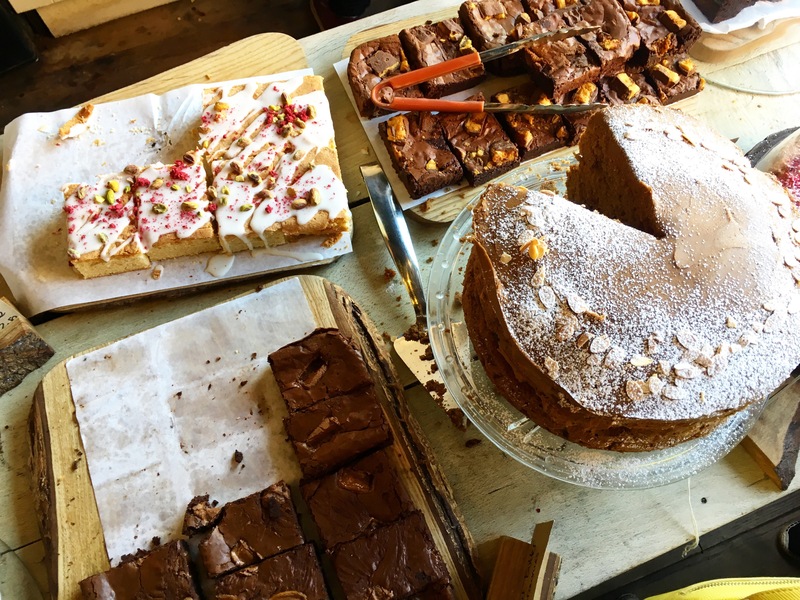 You’ll arrive at an unassuming store front, simple and muted, with the only clue of its deliciousness being the feast of cakes visible through the large, fronted glass window. Push through the door and you’ll be welcomed into an adorable and cosy setting. Rustic, hard wood floors, a line of exposed bulbs in washed out jam jars, long benches stuffed with plump, soft cushions. You might have to wait 15 minutes or so for a decent table, this is Yorks worst kept secret after all; but the cheery team of waitresses have a quick turnaround nailed and believe me, it’s worth the wait. We took our seats and placed our late brunch order. 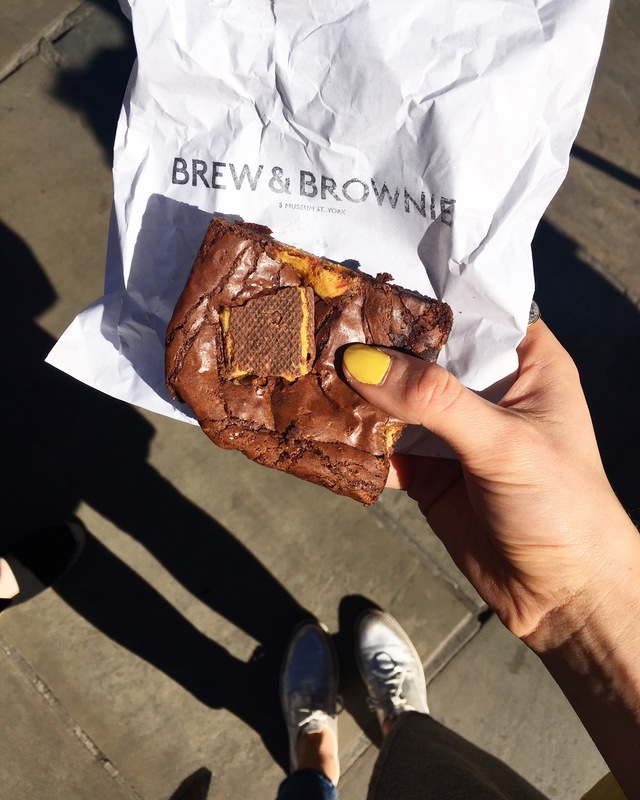 Breakfast items stop being served at around 11:30am, but all the good stuff keeps running (pancakes included) until late afternoon, so you needn’t worry about sacrificing a weekend lie in over a slap-up brekkie – Brew & Brownie have got you covered. We chatted and gossiped as we stole glances at our fellow diners orders, our bellies rumbling in excitement for the most important meal of the day. And a stack of gloriously fluffy pancakes for the table. After seeing them on both tables adjacent, we simply couldn’t resist an order of classic American pancakes; golden, puffy and dripping in maple syrup. We ordered ours dry with a dusting of powdered sugar and a portion of Nutella and salted caramel for extra naughtiness. Ravenous, we dug in to our bountiful spread. The benni was served on thick, chewy, doorstop sourdough, with locally sourced cuts of baked York ham. The hollandaise was rich and golden and coated the soft, subtle flavours of the poached egg whites with its sharp, gooey nectar. Admittedly the egg could have been slightly runnier. But with chunky, salty bites of proper ham to compensate, who could be upset?! We halved our mountain of floury indulgence, cutting into the delicious clouds and drizzling our bites with liberal amounts of salted caramel and hearty dunks of Nutella (a winning combination in case you were wondering). We ate the lot, only speaking to exclaim our joy as we intently ate our way through the fluffy stack. Feeling postively, utterly satisfied – we headed back out into the sunshine to walk off our feast. Their plethora of sweet thangs are just too much to resist before trying to make a break for the door. The Rose and Pistachio traybake was seriously something special, but it was the Crunchie brownies that had my heart. Order to your hearts desire, and enjoy you wicked thing.